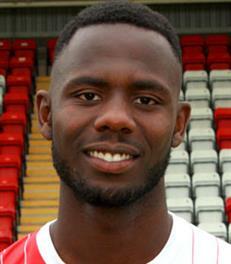 Twenty one year old Emmanuel Dieseruvwe signed for the Harriers in June 2016 after starting his career with Sheffield Wednesday. The tall Leeds born striker never made an appearance for the Owls but went out on loan a handful of times to Hyde, Fleetwood and Chesterfield before signing for the Spirites when he was released. He played against us for Hyde at Aggborough in September 2013 with the Harriers running out 2-1 winners. For the latter part of last season he went out on loan to Mansfield and scored his only league goal so far. ‘Mani’ had signed with us on a one year contract but in March 2017 went out on loan to Boston Utd for the remainder of the season. On his return Mani was released by the club and then joined Salford City on a two year deal.